Apple Pork Tenderloin in Puff Pastry is an elegant main dish recipe perfect for entertaining. 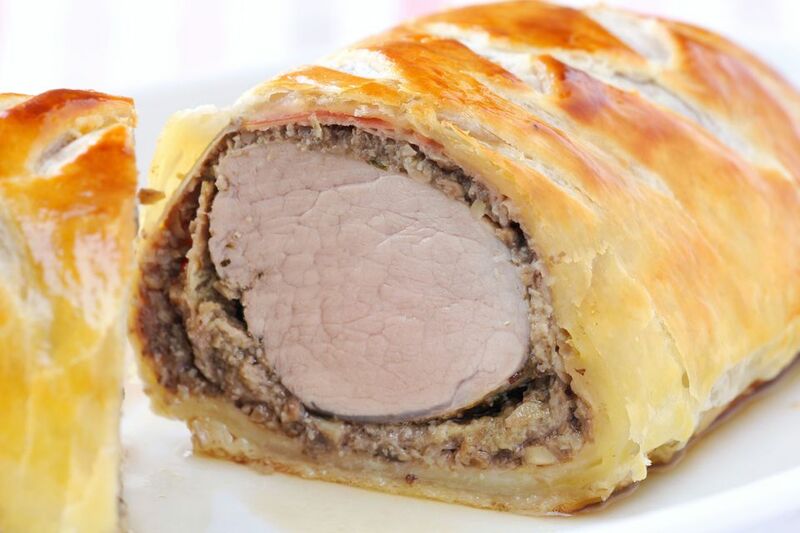 The tender pork is browned and wrapped in flaky pastry with a reduction of onion, apples, and thyme leaves. One note: because you brown the meat, then wrap it in the pastry and bake it, you can't make this ahead of time. Never partially cook meat and hold it, even in the fridge or freezer, for later cooking because bacteria will grow in the warmed meat. And remember that the pork and the filling should cool slightly before you put them onto the puff pastry. Otherwise, the pastry will soften too much and the dish will be ruined. Serve this fabulous dish with a green salad tossed with avocados and sliced mushrooms, and some braised baby carrots drizzled with brown butter. Add some white wine and a nice chocolate cake or pie for dessert for a memorable meal. In a medium skillet, melt the butter over medium heat. Add the pork tenderloins to the skillet; cook until the pork is browned on all sides, turning frequently, about 5 to 7 minutes total. Remove the pork to a plate and let cool while you prepare the rest of the filling. Add the onion and garlic to the drippings remaining in the skillet; cook and stir for 4 to 5 minutes or until tender. Add the chopped apple, salt, and pepper; cook and stir until the ingredients are tender. Then add the thyme and the apple juice or wine; cook and stir until the liquid evaporates. Set this mixture aside to cool for about 10 minutes. Unroll the pastry and roll it out on a lightly floured surface to a 13" square. Cut the pastry into two rectangles. Preheat the oven to 400°F. Spread half of the onion mixture down the center of each pastry rectangle and top with the tenderloins. Brush the edges of the pastry with the egg and bring together; press to seal. Place the bundles seam side down on a Silpat lined cookie sheet with sides. Brush the pastry with the remaining egg. Cut slits in the pastry, and decorate as you'd like. Bake the bundles for 20 to 30 minutes or until the pastry is golden brown and a meat thermometer inserted into the pork right through the pastry reads 145°F. Let stand for 10 to 15 minutes, then slice and serve.